This sled is filled with book titles students read in one quarter. Fill Your Sled! is the theme for my year as the Target® 2011 Iditarod Teacher on the Trail™. I plan to give you ideas, lessons, activities, photographs, and messages to fill your sled with for your classroom. The Iditarod is a teaching tool, and you can look forward to information that’s going to help you use the race to teach those skills students are learning. I teach middle school language arts, but you’ll find lessons and ideas for all ages and all subjects. You may find a lesson for one subject lends itself to a different subject like I did with a physical education lesson by Terrie Hanke, the Wells Fargo 2006 Iditarod Teacher on the Trail™. We did the activity, then wrote a summary and evaluation of it. And, you’re going to find that as you use this teaching tool, your classroom and personal sleds are going to fill with unexpectedly wonderful experiences and ideas. Share them with others during the year by sending them to Diane Johnson at djohnson@iditarod.com. Start filling your sled with the pieces of artwork below. No need to worry about getting permission to use clip art! Created by Michele Turner, art teacher at my middle school, you may use them for educational purposes. Many thanks to Michele! I’ve used the sled dog as a group management tool in my sixth grade middle school classes. Each group gets a laminated paper with the sled dog on it. Inside the dog I wrote ON TASK. Under that, I wrote YES and NO, spaced apart from each other. As groups work, I move around the room, marking tally marks under the YES if the group is on task or NO if the group is off task. This maintains their focus or refocuses students without the teacher having to say a word. Mark with a Vis-à-Vis marker which wipes off easily. Enlarge the dog or sled or team for bulletin boards or decorating the wall. 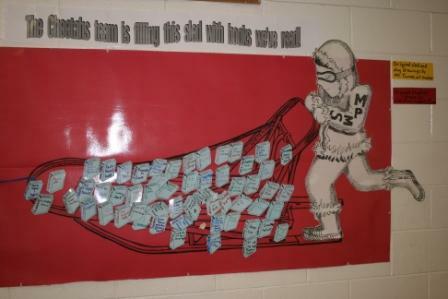 My sixth graders fill a giant sled pulled by the dog with book titles they’ve read each quarter. The “books” they write on are small, laminated “books” which are cleaned and used for the next quarter of school. Your students could fill the sled with character traits, goals they set for themselves, or progress they make in any subject. If your school still has an opaque projector (this is going far back in time! ), use it to enlarge the artwork to gigantic proportions. Here’s another classroom management idea. It’s important for students to have the correct materials for class with them and at hand. Make a written list of materials for your students, but instead of posting a “Materials” list for students to read and gather, post a list on your board called “Gear List” or, as I do, “Gear on Desk”. We talk at the first of the year about the importance of the mandatory gear a musher carries in the sled bag, why the musher must have these items and what might happen if an item is missing. See the race rules, page 7, Rule 16 for the mandatory items list. Students connect this mandatory gear to the mandatory gear they need to have on their desk when class begins. Writing the items on the list reduces or eliminates time spent retrieving them from desks, lockers, within the room, or in the students’ notebooks. This list also helps students learn the value of organizing their notebooks and materials so they are quickly prepared to begin work, just as mushers organize their sled bags to eliminate wasting race time or dog care time hunting for that item that they knew they had somewhere, if they could just find it! A dog for bulletin boards, borders, trail maps, or on-task monitoring. Sled dog team for borders and more. A sled for your class to fill.